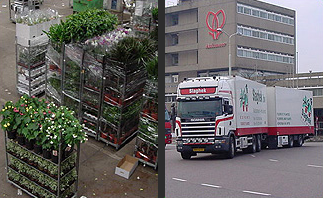 Slaghek Export b.v. is an exporter of plants situated at the Aalsmeer Flower Auction. We export to almost all of Europe. France, England and Greece are our most important sales countries. For transport we use our own trucks and reputable carriers. On this website you will find information about the history and activities of our company. The photo section contains several photos of the Aalsmeer Flower Auction, our workplace and other related issues. If you have any questions or remarks after viewing this site, you can find our contact information on the contact page.